When do you know that the treadmill belt needs replacement? Often when observing the walking belt we stop to check if the belt is ok. We look at the side edges, we see that they look normal, we feel that the belt is in a good condition, the belt is in the right place. However, even in this situation the belt might still need to be replaced. The lack of visible external signals that the belt has to be replaced, it is not a full insurance that all is fine. The belts are more likely to have problems on the bottom (white texture) than on the upper black side. On the texture side any problem will result in increased treadmill electrical consumption (which in a short time make electricity much more expensive than you would have spent on a new belt) and may bring to failure of expensive components such as controller and motor. 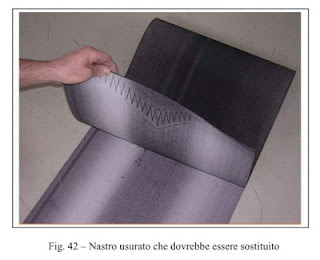 The following picture, from the technical service manual of a well-known European manufacturer of fitness and medical equipment, shows that when you see the black cloth appear on the underlying ribbon, this is to be replaced, although the outer rubber still looks good and even if the edges (where you do not walk) the belt appears still white.